At Apple’s yearly World Wide Developer Conference (WWDC) in June 2014, Apple announced a new programming language called Swift that the company had been developing since 2010. This was a huge announcement; Objective-C had been the primary language of choice for developing most Mac and iOS apps for many years. The excitement surrounding this language was palpable. Twitter lit up with tweets about Swift, domain names with Swift in the title were being purchased left and right, and within 24 hours of the announcement, more than 300,000 copies of Apple’s Swift iBook had been downloaded. People were ready for change. But a new language brings not only syntactic differences but also idiomatic differences and new conventions. Swift is not just an object-oriented language, but it introduces fea- tures gleaned from other languages, such as C#, Haskell, Ruby, and more. Touted to be “Objective-C without the C,” Swift has evolved so much over the past year that it is difficult sometimes to see any similarities. Swift builds upon familiar concepts from Objective-C but includes a more modern, safer syntax and multiple paradigms such as object-oriented, functional, imperative, and block structured, as well as reintroducing itself at WWDC 2015 as a protocol-oriented programming language. Swift is officially at version 2.0 but is still evolving, and even as this book is being written, more changes are entering beta. With that said, this book is current as of Swift 2.0 and Xcode 7. If there are changes that you find in these examples that do not work as described or with screenshots, please check Apple’s release documentation and electronic versions of this book as they can get updated a lot faster than the printed book you may have in your hands. Also, all the code examples from this book are available and will be kept up-to-date in the GitHub repository: https://github.com/STYSwiftIn24H/ExamplesV2. Swift is already proving to be a great language and as of its release is compatible with iOS 7 and up. Swift can also be written for apps running on OS X Yosemite and later. Updates are coming from Apple rather quickly, so if something is not available that you need or if some- thing is not working as expected, consider filing a bug or feature request at http://bugreport. apple.com. This book is designed for a beginner-intermediate level programmer. 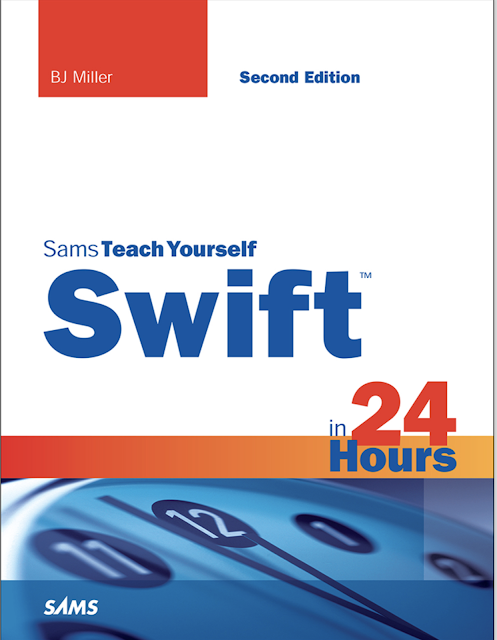 Even advanced pro- grammers who are not yet familiar with Swift can benefit from this book. You do not have to have a background in software development to make your way through this book, although it may help. If you are not familiar with software development whatsoever, you may benefit from more fundamental books first, although with the examples inside this book, you may be able to follow along just fine. In this book, I assume you have a passion to learn about Swift and to develop apps for the Mac and/or iOS platforms. I also assume that you are willing to carve out time in your schedule to take this book seriously and learn the concepts herein. This book is a guided tour of the Swift programming language, discussing some of the ins- and-outs of Swift, best practices, do’s-and-don’ts, and more. It is not just a language refer- ence. By the time you complete this book, you should have a firm grasp on many of the concepts in Swift including the syntax to make them come to fruition. You should not expect to be able to write award-winning iOS or Mac apps right out of the gate by just reading this book alone, as this book is not meant to be a one-stop-shop for learning everything about app creation. Such a book would be thousands of pages long. Rather, there are more components to writing apps, particularly the Cocoa and Cocoa Touch frameworks, which deserve books in their own right (and many exist). You should write apps via careful planning and development, and depending on how many different technologies your app includes, you may need more resources. You also do not need to read this book from cover to cover before attempting to write apps of your own using Swift. Feel free to experiment along the way with your own apps, or use this book for reference if you are stuck in an app of your own and need some guidance. Also remember that this book is current as of Swift 2.0 and Xcode 7, so please understand that changes may be made after this book has gone through final edits and been printed. Code examples will be updated as progressions in the Swift language and Xcode envi- ronment change. They are available on GitHub at https://github.com/STYSwiftIn24H/ ExamplesV2.